Gros Islet is no stranger to bacchanal. Since it's evolution from a sleepy fishing village to its world renowned 'Friday Night' street party many old folk lament that "the village" has taken many a turn for the worst. At one point in its not too distant history the residents had been described as the most ignorant and combative people in Saint Lucia, that is, after Aux Lyons in Dennery. Anyway, this bit of superfluous information was just to set the stage for the rorotious scandal that has thrust Gros Islet, front and center, into the public eye once again for all the wrong reasons. Mind you, the troubles with "the village" always seem to be caused by outsiders. This time the outsiders came from far, far away. Keep Cool Restaurant and Bar was a quiet spot, and just as the name implied patrons could keep cool and enjoy a nice meal and drink in a friendly and relaxed atmosphere. Of course on the weekend you could also catch a good grind at the dance hall which was situated upstairs. And look grind you could get there oui! Gros Islet girls were definitely not known for having concrete in their waists. Fast forward to recent times and Keep Cool (as it was affectionately called) underwent a transformation from a drab 'hall' to a bright peach and white edifice. It stood out at 139 Dauphin Street like a proud peacock blinding those who dared look at her new colours for too long in the St. Lucia sun. Ask any local and they would tell you that those colours must have been chosen by someone of a particular ethnic persuasion. The transformation came with a name change too, Lambirds Academy. Just imagine, from keeping cool to lambs and birds, brilliant. Someone must have taken a lot of time to come up with that air of je ne sais quoi. 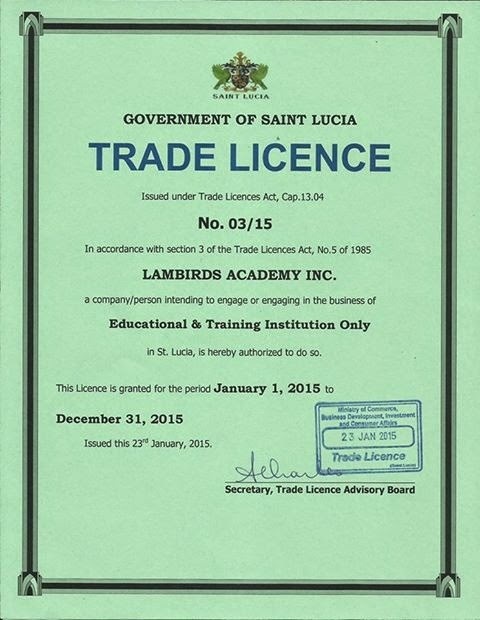 Lambirds Academy set up shop in Gros Islet quietly. According to their advertising the institution is a "Ministry of Education approved Institution providing specialized training in Hospitality, Tourism, Trade, ICT, Health and Cruise Management Courses." In fact, this information is still available for the whole world to see on their website. On Friday February 27, 2015 the Royal St. Lucia Police Force confirmed the arrest of several individuals in the north of the island in connection with an Internet scam targeting Asian nationals who were to attend Lambirds Academy in Gros Islet. These individuals are Iftekhar Ahmed Shams of Bonne Terre, Koushal Kumar Batukbhai Chadasama of Bois d'Orange, Gurjeet Singh Vikku of Bois d'Orange, and Ashwin Kanji Patel of Bois d'Orange. 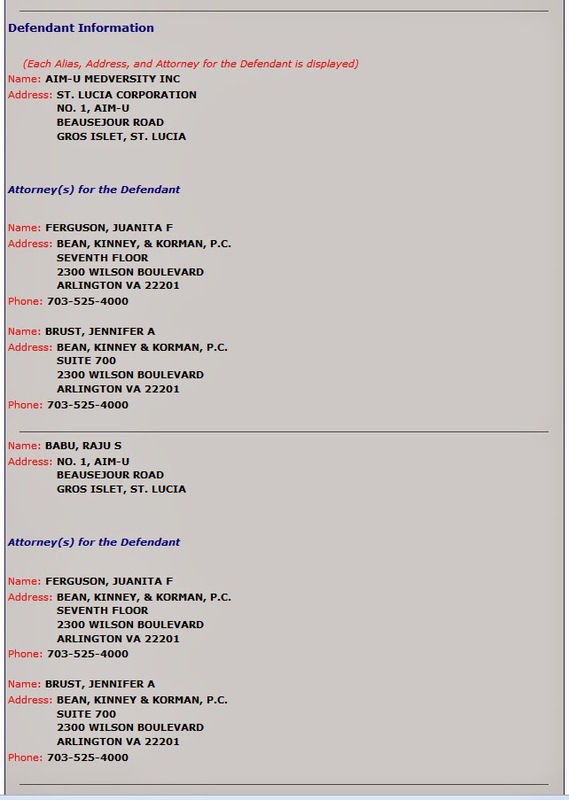 Charges against all four have been confirmed to be human trafficking. Iftekhar Shams was later charged for money laundering of over EC$700,000. These monies which were deposited at a local bank have been frozen by local authorities. Computers and other evidence have also been seized. This all started going downhill when students from Nepal and the Philippines who had traveled to Saint Lucia to begin classes arrived at the school doors only to find them closed. 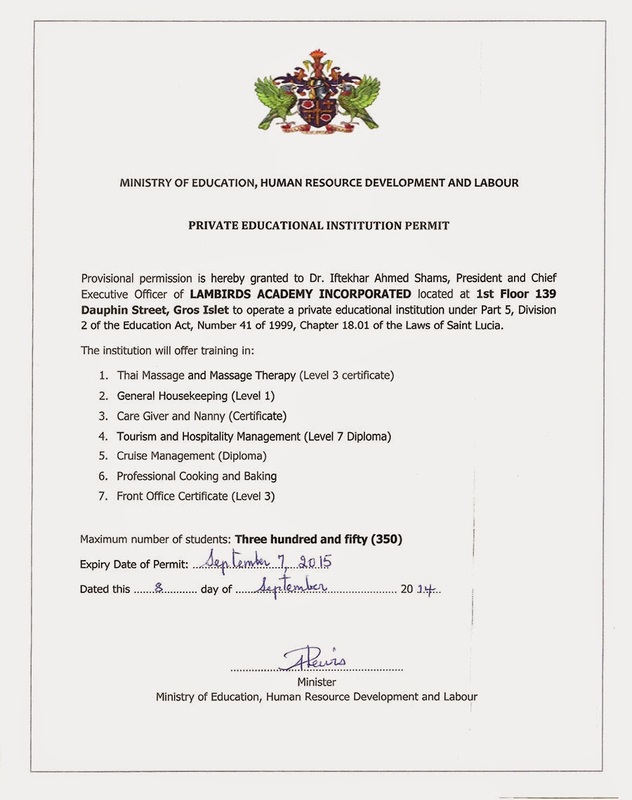 They report that they had taken loans or sold properties to raise the funds in order to pay the tuition and other fees required from Lambirds Academy. According to reports some of them paid US$13,000 for tuition and visa processing, as well as thousands more for their airfare to Saint Lucia which in most cases involved air travel time of over twenty four hours. 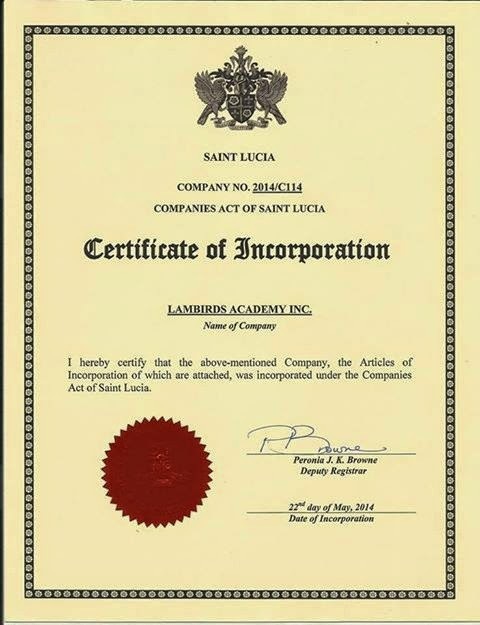 According to the students they were convinced that Lambirds Academy was authorized to operate in Saint Lucia because they had received 'proof' of such authorization with copies of the said licenses and paperwork. 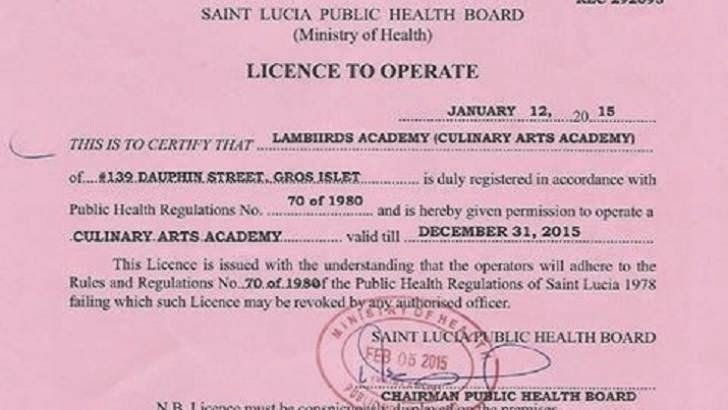 Notwithstanding the police actions in this case there has been a ghastly silence by authorities from government Ministries who have responsibility for the issuance of licenses and other authorizations for Lambirds Academy to operate in Saint Lucia. There has continued to be a grave concern by Saint Lucians about the potential negative repercussions to the island's credibility because of this scandal. In it's defense the relevant authorities can easily confirm or deny the authenticity of the documents presented by the students which claim to be issued by the very government Ministries responsible. And what of the saint Lucians who were also arrested last week? Who are they related to? 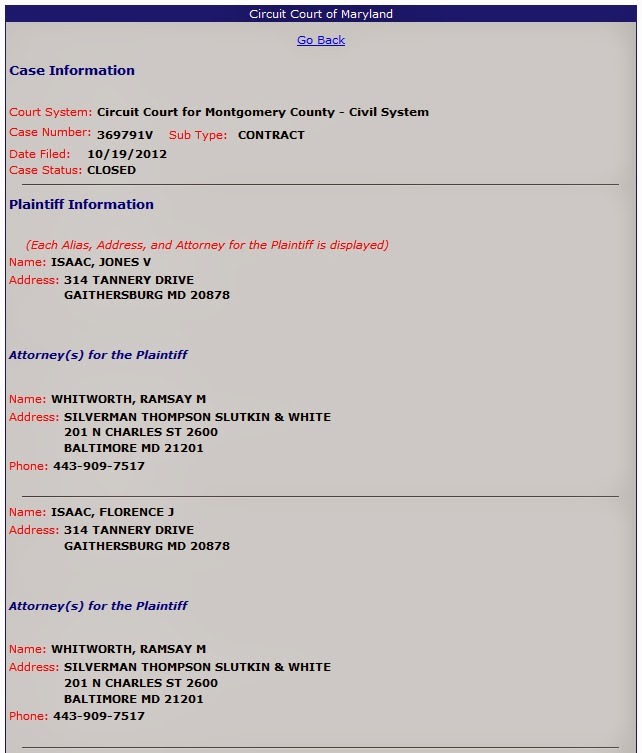 Is any one of them related to a high ranking government official responsible for the issuance of a license to operate? Is that individual also listed as a signatory on the account which was frozen by police? Is the silence by officials an indication that there has been a lack of due diligence in this process? Have the relevant documents which should be on file mysteriously disappeared? Who is on the board of directors of this company? What of the visa process? How are visas procured for students traveling to Saint Lucia to attend a local institution? Should this process be re-examined? These and many more questions are being asked on social media and on the streets of Saint Lucia with no response or clarification from local officials. What is the reason for this unimaginable silence? In the light of this rather troubling dabacle it would be prudent, and very well advised, that the procedures for the application and verification of foreign institutions wishing to operate in Saint Lucia be completely revamped, as it appears there was a colossal failure of the system or some cocomackackery was allowed to infiltrate the system. 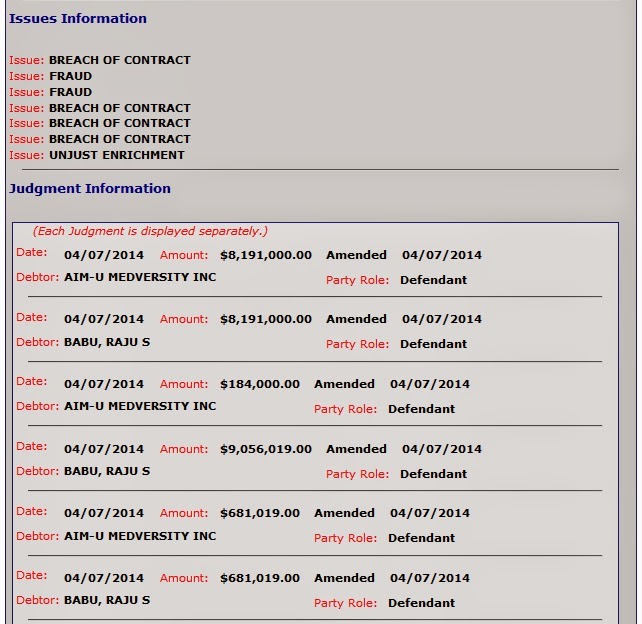 Furthermore, in light of this Lambirds Academy scam and scandal it has been discovered that another offshore educational institution AIM-U at Beausejour Gros Islet has been at the receiving end of a judgement of huge proportions for fraud, breach of contract, and unjust enrichment in a Maryland, USA court. This is indeed serious and requires immediate attention, in my humble opinion. As a matter of fact, particularly in the light of this judgement for fraud, it would be prudent to revamp our laws to require any such institution to report any judgements of fraud, against them, to the relevant local authority within a specified time period. It would be unimaginable that we should not be aware of such judgements when the potential fallout can be damaging to Saint Lucia's reputation. Any such measure can only be considered as logical. What about a requirement for the declaration to authorities when any member of the board of directors of such institutions has a judgement rendered against them for fraud? It is high time we become a little more proactive about safeguarding our reputation as a small country. Up to now not a peep from the duly elected representative for Gros Islet. No word from the Ministry of Education or Labour. No word from the Ministry of Legal Affairs and National Security. Is there a reason for this when the answers which Saint Lucians so desperately ask for are easily gotten? This operation is too big to not have had local facilitation. To what level and with whom is what the bothers everyone. Is this a case for some serious lolo bef? 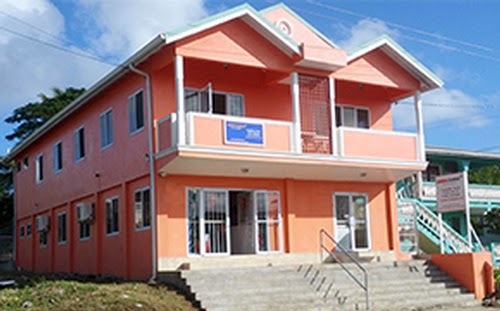 Since all persons on Saint Lucia soil are guaranteed the same protections under the law, in the interest of fairness and equality a public defender should be appointed to safeguard the rights of these students and a lien be placed on the frozen funds to be paid from in the event of a judgement against. By doing so, some form of recompense would be guaranteed for the students who were mercilessly scammed. This would be the right and equitable thing to do. Every day which passes by without a statement from the authorities, other than from the police, causes more suspicion and speculation on whether a coverup is being witnessed. It continues to bewilder Saint Lucians on the eerie silence from officials. And we talk about economic citizenship?